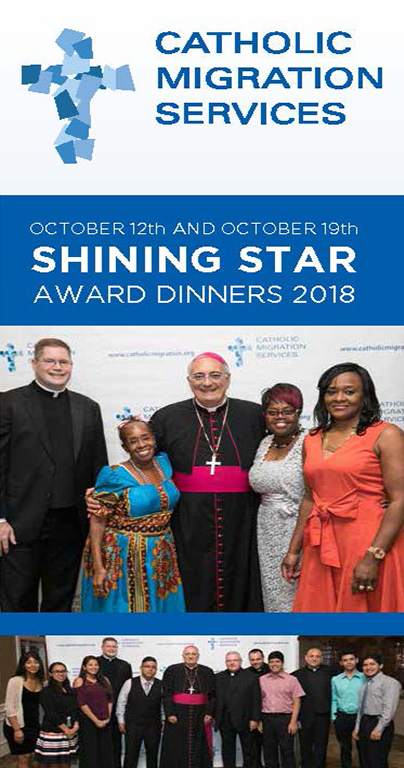 Catholic Migration Services is proud to once again host our annual Shining Star Award Dinners at Gargiulo’s Restaurant in Coney Island on Friday, October 12th and Friday, October 19th, 2018. This event serves as the primary fundraiser to support the legal and pastoral services of Catholic Migration Services. Whether you are an attendee or you purchase a journal advertisement, your generosity will help us continue our work with immigrants in Brooklyn and Queens. For sponsorships, journal ads and tickets please see below. Click here to download the full 2018 Shining Star Award Dinner Invitation and Sponsorship and Journal Ad opportunities as a PDF.